We’re happy you found us. As Halifax chiropractors, one of our goals is to help members of our community understand all that chiropractic care has to offer. From the moment you walk into our door, we hope you’ll feel right at home. Here’s what you can expect from your first visits with us. 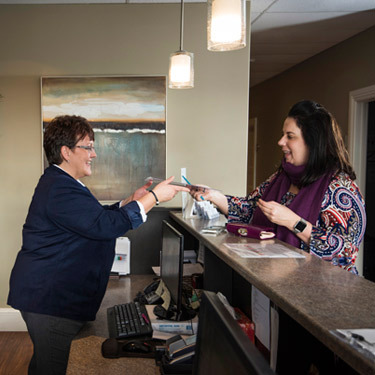 As you enter our practice, you’ll be greeted by our smiling staff members who will be happy to assist you with filling out your new patient paperwork if you haven’t already done so online. Next, they’ll offer you a tour of our practice and take you back to an examination room where you’ll meet with Dr. Doug, Dr. Karen or Dr. Sasha. After a thorough physical examination, questions and listening to your each and every concern, our doctors may or may not recommend X-ray’s. If we do, we’ll refer you out to a local center to have them done. You can expect your initial appointment to last between 30-45 minutes. During your second appointment, we’ll review your entire report of findings in detail and give you the opportunity to ask us any questions. From here, we’ll discuss what type of treatment plan will help you improve your health and areas of concern. If you’d like to begin care, we’re happy to do so the very same day. During your first few weeks of care, we typically like to see patients three times each week. After that, we’ll evaluate your progress and make any changes necessary in the frequency of your care. When you choose Clayton Park Chiropractic Centre for your healing, you can be sure that we’re interested in helping you lead a better and healthier life, not just bringing you out of initial pain. Through our corrective care offerings, we aim to craft tailored adjustment plans using a variety of techniques, and we don’t stop there. If we feel that massage therapy, physical training or kinesiology care can help you, we may recommend an initial visit with our Registered Kinesiologist and Certified Personal Trainer, Ashley Howatt or our Registered Massage Therapist, Michelle Holmes. During a visit with Ashley, she’ll give you recommendations for at home stretches and exercises you can do to enjoy even better results on your journey to wellness. The choice to continue appointments with Ashley is entirely up to you. Wondering how our team of amazing doctors can restore your body’s ability to heal itself? Schedule your free consultation with Clayton Park Chiropractic Centre today to learn more.